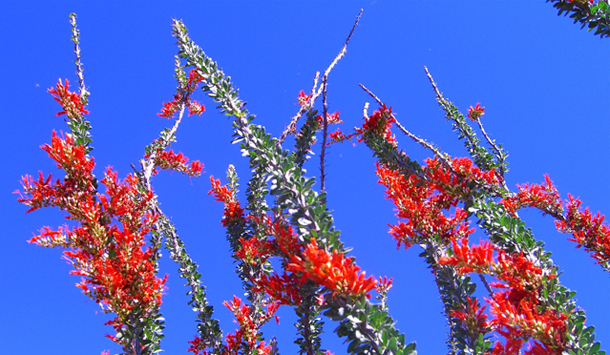 Ocotillo translates to “little pine” and may be a reference to the oily resin that coats the plant’s stems. Ocotillo is typically leafless most of the year and only produces leaves when it receives water, with the leaves dropping off once the soil dries out. When transplanting Ocotillo you should try to retain the original orientation of the plant as the south facing side of the plant will be more sun and heat resistant. Ocotillo (also known as “Candlewood” or “Devil’s Walking Stick”) is a unique desert plant made up of numerous spiny canes branching from just above ground level. Ocotillo requires excellent drainage, full sun, little maintenance, and typically reaches a height of 15-20 feet with a similar spread. It is covered with thorns, making it very deer resistant. Ocotillo produces and drops leaves in response to moisture levels, sprouting leaves along the canes after rains and dropping them once the soil dries out. Its main interest however is its sculptural form, which can be striking whether the plant is bare, covered with leaves, or in bloom, making it an excellent accent plant. 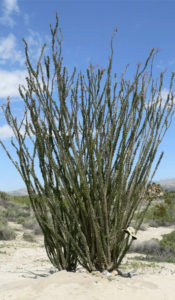 Mexican Ocotillo (Fouquieria macdougalii) retains its leaves and blooms for a longer period of time and has a more dense growth habit, but is less cold hardy. Fouquieria splendens is native to the Sonoran and Chihuahuan deserts from Baja, California to the Trans-Pecos region of Texas and south to Zacatexas, Mexico. It grows in sandy and rocky soils and has a very shallow root system (usually only 6” deep) that is adapted to quickly soak up moisture from the brief rains in the desert. Ocotillo is however very opportunistic when it comes to moisture and can grow in areas that receive as much as 20” of rain annually (compared to the 6” average in the desert) as long as it has good drainage as standing water will lead to root/stem rot and will kill the plant. 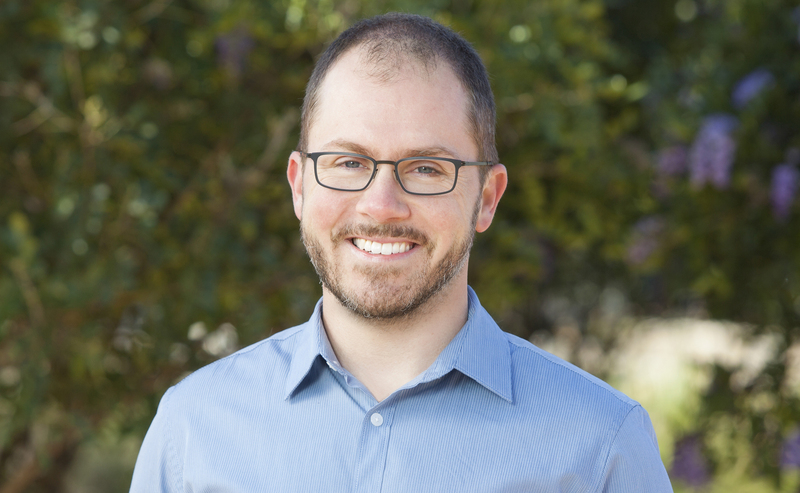 When transplanted, water weekly during warm weather and then every 3 weeks to a month in cold weather until established, at which point rainfall should be sufficient in all but the driest and hottest conditions. Because the plant is covered in spines, it is not susceptible to grazing pressure and is a good choice for areas where deer are problematic (although deer will eat the flowers). Flowers appear from March through July and provide a vital nectar resource for migratory hummingbirds. Plants are available commercially, ranging from 1 to 25 gallon sizes with larger options occasionally available. Plants in the nursery trade can vary greatly in how they have been handled however. 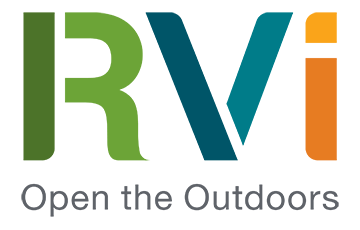 Harvesting wild plants from ranches is common and plants are frequently pulled up rather than dug up and are often stored bare rooted in stacks. 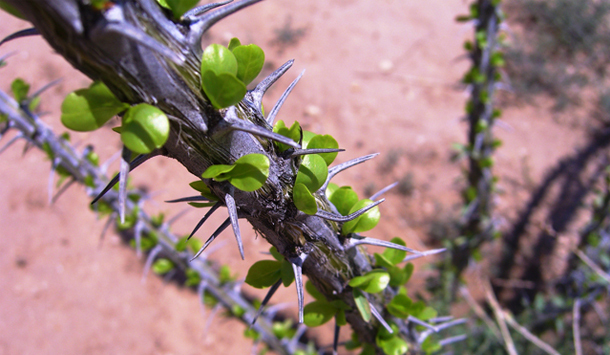 While Ocotillo is very tough, plants treated in these ways have low survivability. It is best to ask a lot of questions before making a purchase as saving money upfront may lead to poor survivability of the selected plants. Always ask how the plant was harvested (dug or pulled), how long it has been sitting, if it is bare rooted, if it has been stored in sand or soil or open air, etc. The best plants will have been grown from seed. While these will be more expensive, they will be healthier and more likely to survive and thrive. Second best is hand dug with sharp shovels so that the roots are still protected from the elements and the cuts are smooth and likely to heal faster. Try to avoid plants that have been pulled and stored bare root in open air (which is the most common practice unfortunately). Use Ocotillo as an accent plant for its sculptural form. Plant away from walkways and areas where pedestrians might bump into it and ensure that it has excellent drainage and never sits in standing water.